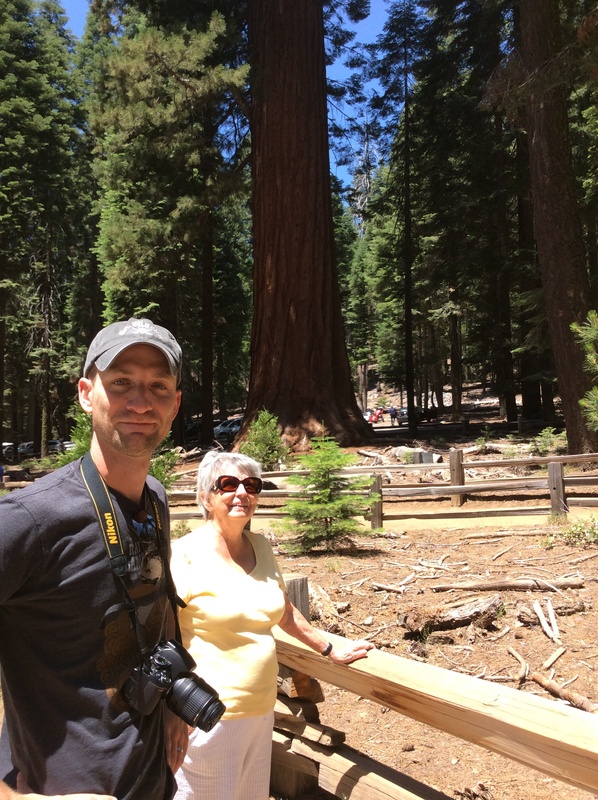 We checked out of the hotel and went to Yosemite for a trip to Mariposa Grove this morning. 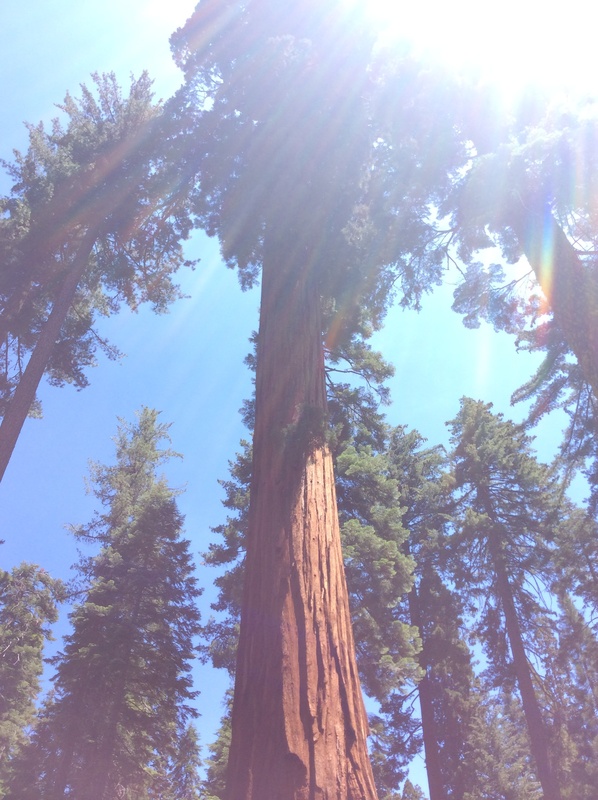 Getting to Mariposa is kind of a pain during peak season–you have to park six miles from the location and take a shuttle bus up to the grove, and then, we discovered, you have to take another shuttle to the largest sequoias once you get to the top unless you want to hike. 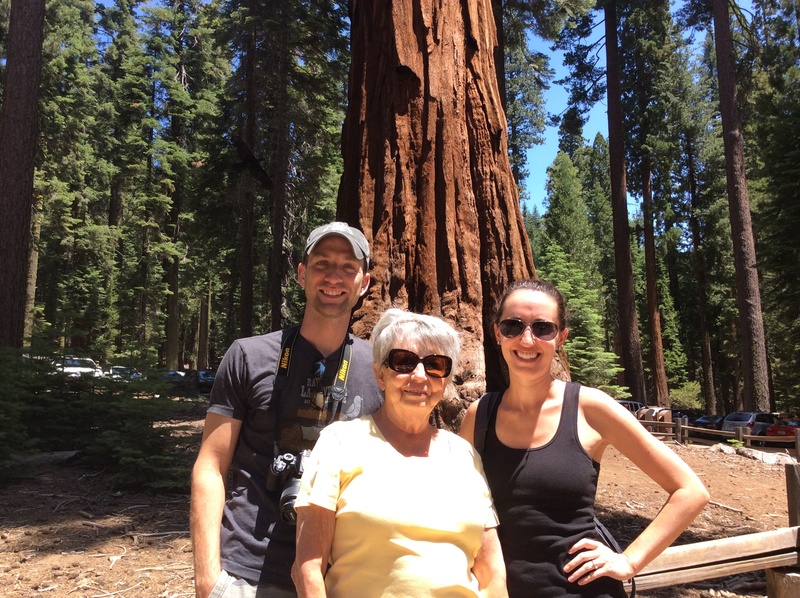 The guidebook misled us a bit, so we discovered on the shuttle bus ride up to the grove that it was an hour hike to the largest trees or another shuttle ride. I had Tim run off the bus to try to get tickets for the next shuttle, but when he got there he found out that they were sold out for the next hour and a half. Because we had miles to travel, we couldn’t wait around for the next availability. 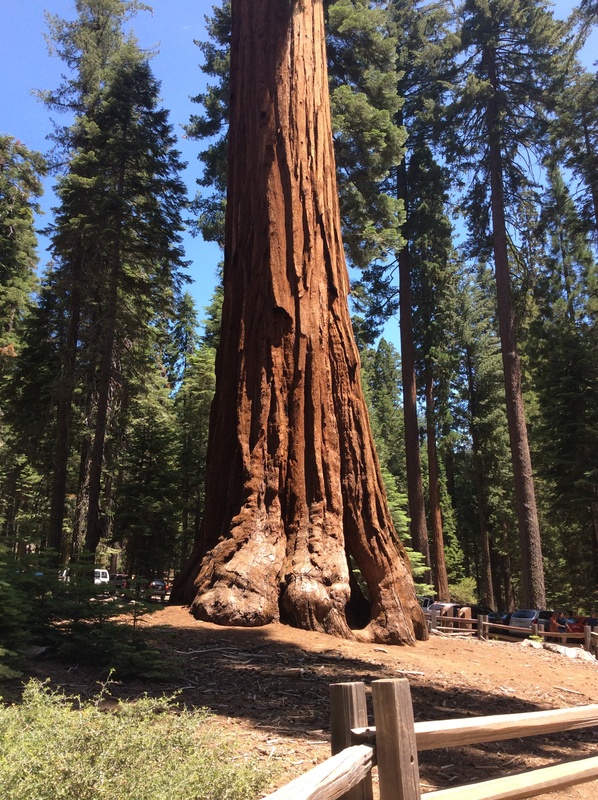 I was disappointed for Tim because he was looking forward to seeing the biggest tree in the park, thought to be the biggest sequoia in the world (30 feet across and over 2,700 [yes, over two thousand] years old). Tim decided it would just give him another reason to come back. There were a few sequoias next to the shuttle loading area, so we checked those out and then waited in line for the next shuttle back to the parking lot. When the shuttle arrived, everyone crammed on, and by the time we got to the doors, we realized the bus was standing room only. I didn’t want Grandmother to have to stand on the bus, and Tim said we’d just wait for the next shuttle. Grandmother insisted that we go ahead and get on the bus, and the bus attendant said he felt sure someone would give up their seat for Grandmother. 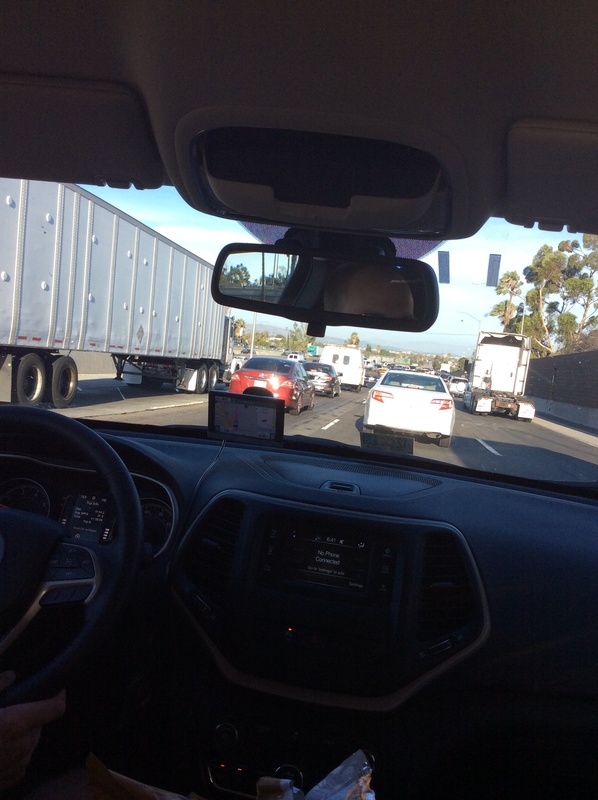 We stopped in Irvine for some dinner and booked a hotel in Oceanside. Once we were back on the road, it wasn’t long before I could make out the dark form of the ocean to the right of our car. We’ve reached the Pacific! David Cheng is expecting Grandmother tomorrow around 11, and after Tim and I drop her off, we’re off to San Diego to see Tim’s brother, Lee. Tomorrow is Lee’s birthday, and as a birthday gift, Tim will be helping Lee move. 😉 After an afternoon of moving and visiting with Lee, we’ll head back to David’s to visit a bit there (I was such a tiny girl the last time I saw him! ), and then we’ll be on our way to LA for our flights out the next morning. 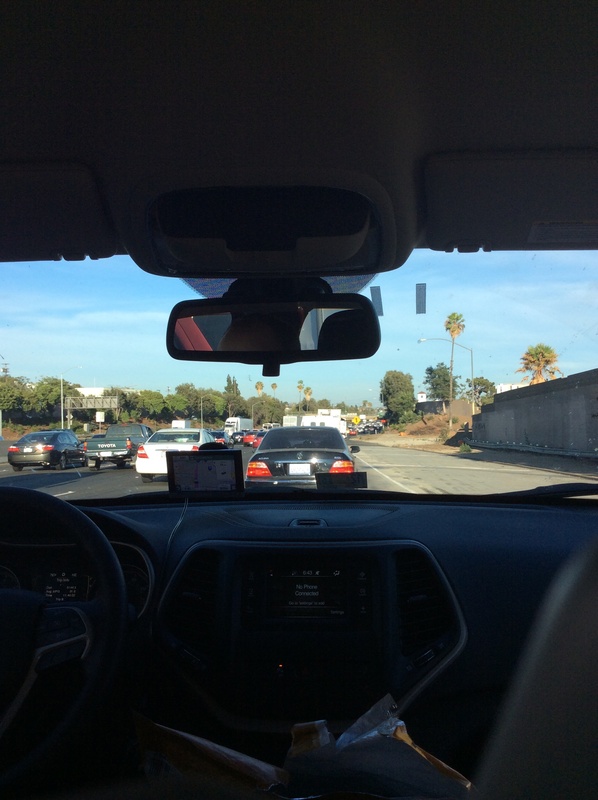 Lee has said it’s a pretty drive along the coast between San Diego & LA. Know Lee enjoyed that special visit on his Birthday!